Are Daily Realms randomly generated? Re: Are Daily Realms randomly generated? Sorry for re-bringing that up, but this time, it's about enemies instead of wall placement. Indeed, I've got the same enemy packs three times/days in a row! There must be a bug somewhere because the odds for that to happen are infinitely low. Has anyone else experienced this? That explains it, then. Thank you for the answer! Are they? Because over the past few (I've only noticed it since three or four dailies) that I've done, all were strikingly similar. 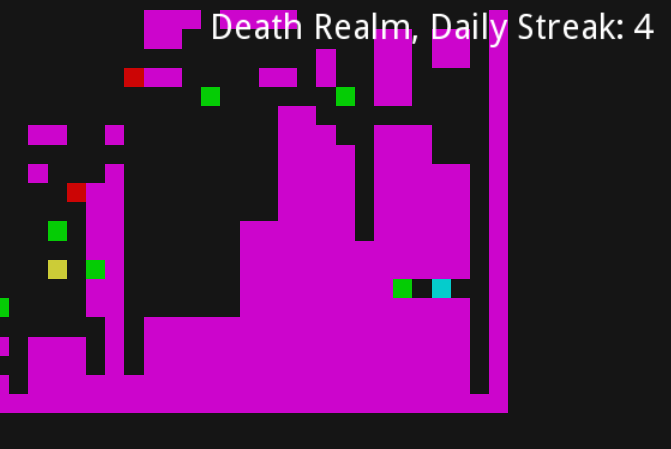 An example would be in the bottom right corner of the map; usually, there is a path going down until it hits the bounds and a short way from the end, there is another path branching left from the first one for only a few blocks and then a chest. I've already encountered these shapes during normal Realms so they must be part of the pool. But finding them three or four times in a row means that either I'm very lucky/unlucky or they aren't randomly generated. Do you have a log of all the past recent dailies to confirm this theory?